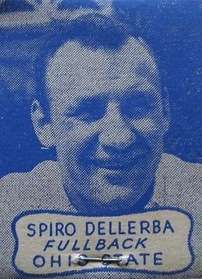 Spiro Dellerba (January 25, 1923 – August 19, 1968) was an American football fullback and linebacker who played three seasons in the All-America Football Conference (AAFC) between 1947 and 1949. Dellerba played for the Cleveland Browns and the Baltimore Colts. Dellerba grew up in Ashtabula, Ohio and attended Ohio State University. After serving in World War II, he joined the Hamilton Tiger-Cats for one year in 1946 before joining the Browns, becoming the first man from Ashtabula to play professional football. Dellerba then played two seasons for the Colts before leaving the sport. Dellerba was from Ashtabula, Ohio and attended high school there. He played football and basketball at Ashtabula High School. Dellerba attended Ohio State University starting in 1941 and played on the school's football team under head coach Paul Brown. Dellerba, however, was one of seven Ohio State football players dismissed from the school in the summer of 1942 for failing to maintain a 1.5 grade point average. Dellerba served in the military during World War II and played football for the Personnel Distribution Command Comets, a service team. Dellerba played a season for the Canadian Football League's Hamilton Tiger-Cats in 1946. The following year, he joined the Cleveland Browns in the All-America Football Conference (AAFC). Dellerba was the first man from Ashtabula to play professional football. The Browns finished the regular season with a 12–1–1 record and beat the New York Yankees to win the AAFC championship. Dellerba was sent to the Baltimore Colts in early 1948 along with Browns teammates Lew Mayne and Marshall Shurnas as part of an effort to balance talent among the AAFC's teams. He spent two seasons playing for the Colts before leaving football. 1 2 "Ashtabula Meets Berea Tonight". Painesville Telegraph. Ashtabula. March 13, 1941. p. 13. Retrieved September 16, 2012. ↑ "'Bula Power Sweeps Over Harvey Line". Painesville Telegraph. Ashtabula. September 28, 1940. p. 7. Retrieved September 16, 2012. ↑ "Ohio State Is Hard Hit". Youngstown Vindicator. Columbus, O. Associated Press. June 25, 1942. p. 19. Retrieved September 16, 2012. ↑ "Command Eleven In Action Here Sunday". The Rotator. October 12, 1945. p. 1. Archived from the original on October 7, 2012. Retrieved September 16, 2012. ↑ Shields, Tommy (December 19, 1947). "Round And About". Ottawa Citizen. p. 22. Retrieved September 16, 2012. ↑ Sauerbrei, Harold (August 18, 1947). "Dellerba, Cowan Shine in Intra-Squad Game". Cleveland Plain Dealer. Bowling Green, O. p. 15. ↑ "'Bulans To Fete Spiro Dellerba". Painesville Telegraph. Ashtabula. September 26, 1947. p. 14. Retrieved September 16, 2012. ↑ "Colts Obtain Three Players From Browns To Strengthen Team". Chicago Daily Tribune. February 21, 1948. p. A2. Archived from the original on October 7, 2012. Retrieved September 16, 2012. ↑ "Spiro Dellerba NFL Football Statistics". Pro Football Reference. Archived from the original on October 7, 2012. Retrieved September 16, 2012.